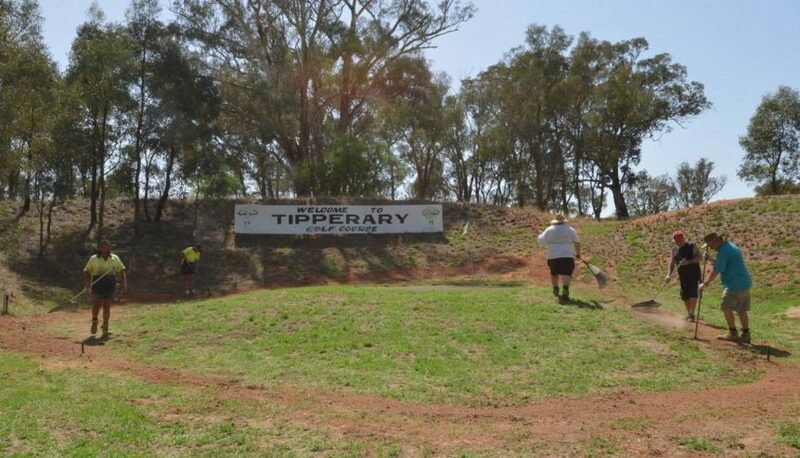 Members of the Tipperary Golf Club have been working hard as the club starts to spend some of its grant that it was awarded last year. The club received $74,791 in November last year from Member for Cootamundra Steph Cooke through round two of the NSW Government’s Stronger Country Communities Fund. Tipperary Golf Club president Barry Hazlegrove and 15 other members worked tirelessly in the heat alongside Pete Walton and Kerry Foley from Powderly’s Pumping and Irrigation on Tuesday and Wednesday to dig the trenches and lay the pipes for the club’s new watering system around the greens on the course costing $11,046. “This part is only a small part of the grant,” Mr Hazlegrove said. According to Mr Hazlegrove the new sprinklers will cover a total of 14 meters, watering the 7 meters to the green and the actual greens themselves as well. The club also plans to install a storage shed with the grant money that will enable members to leave their golf carts at the club as well as store various tools used to maintain and keep the greens worth $34,000. “We’ve made applications to the lands department and when we get permission from the lands department we’ve got to go to Council and we hope that we’ll start that in February,” Mr Hazlegrove said. There is also $32,000 the club will be spending on upgrading the roads on the premises to help redirect water so it doesn’t lay across fairways and greens. Mr Hazlegrove said that as the president of the golf club he would like to thank profusely the members who helped out earlier this week and wanted them all to know their time and work is greatly appreciated.